Lowering the ball is a game that offers the opportunity for more players to participate It is the game that involves communication and understanding between the participants so that the action of lowering the field tennis ball in bowl implies a good verbal and physical collaboration. Physical refers to the fact that players need to bend or rise in dependence on the understanding they are doing when trying to transfer the ball on the string and lower it so that it will hit. You can play this game in a room as well as outside. Because it does not involve external obstructions. Prepare to have a few medium-sized ropes and have the same lengths. It is important that the players who start to deliver the balls have the balls available in a bowl to be able to take and transmit easier. 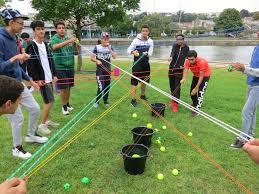 How fast field tennis balls are played depends on the teamwork of each group. Step 1: 10 participants are selected, divided into 2 groups. There are 5 groups of 2 players. Step 2: Each group receives a 5-meter rope and a bend in two. This is how you get a twisted rope in 2 feet long. One player in the group is at the end of the rope and the other at the opposite poles. Step 3: Both players stretch the rope that is bent in two. There is a circle in which 5 players are inside and 5 outside the circle. Those outside the circle must have at their disposal 5 tennis balls. Step 4: At the start, those outside the circle take a ball in a row and put it on the long rope and send it to the end of the rope. The one inside must bend the hand so that the thread is lower than the other player’s hand. The goal of the game is to have each group target several balls in the pot in a certain time. Step 5: If a ball falls down while it is being transmitted, then it is raised and put from the beginning. Step 6: It is considered the winning team that has hit several balls transmitted on the bent rope, within one minute. The game itself is not hard, but to be the winner you need to be careful and balance the rope in such a way that you do not get rid of the field tennis balls. The rope that is placed in two should be stretched well. A player must be with higher hands, the other with his hands down to lower the rope.